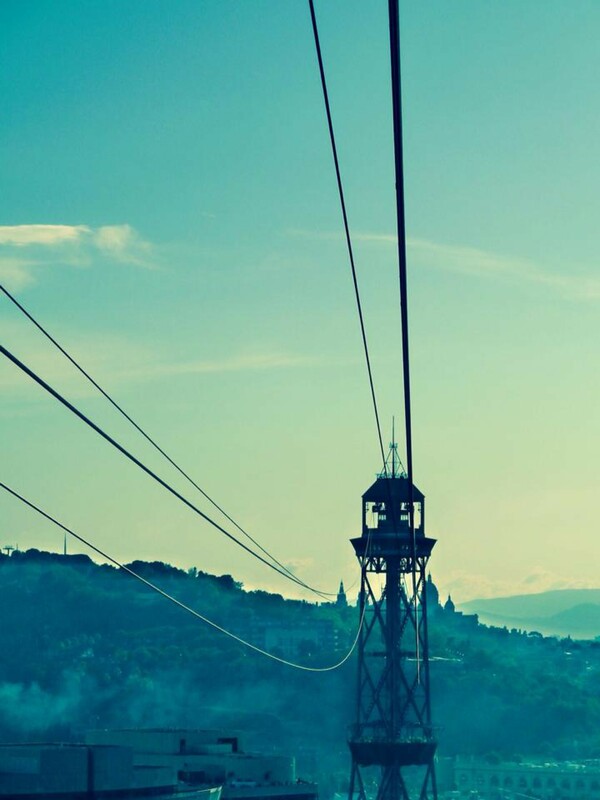 AquaDom: A breathtaking ride | The Lifestyle Factory. 13 mei 2015 The Lifestyle Factory. What does a sustainable city of the future look like? How are our current cities developing and how do we give an identity to new habitats? An answer to this could be that a city should have plenty to offer. More often cool initiatives are showing up in cities, which might achieve this. This to make a city livable and/or escape crowded places. People are looking for new spaces for their activities. Although flights are becoming cheaper, we do not have to travel far for more rest and/or see imposing things. We can find things closer to home. A good example is the ‘AquaDom’. 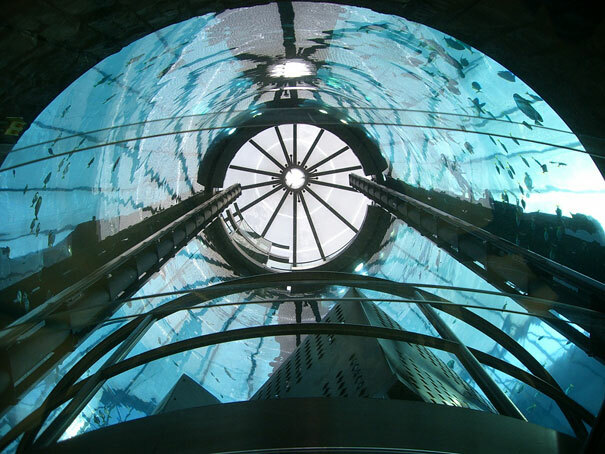 The AquaDom is a giant cylindrical acrylic glass aquarium of 25 meters high (82-foot) with a diameter of over 12 meters, built on a 9 meters tall concrete foundation. It’s filled with nearly 1 million liters of seawater and contains about 1500 fish of 97 different species. The aquarium weighs over 2,000 tons. The AquaDom is the largest acrylic glass cylinder in the world with these impressive measurements. The enormous and beautiful aquarium has a built-in transparent elevator that takes you on a spectacular underwater experience. Here you’ll learn about the tropical fish inhabitants and the architecture of the AquaDom. Besides, guests have the opportunity to watch the AquaDom being cleaned and the fish feed by a pair of full-time scuba divers. 8 kilogram of food is being served each day. 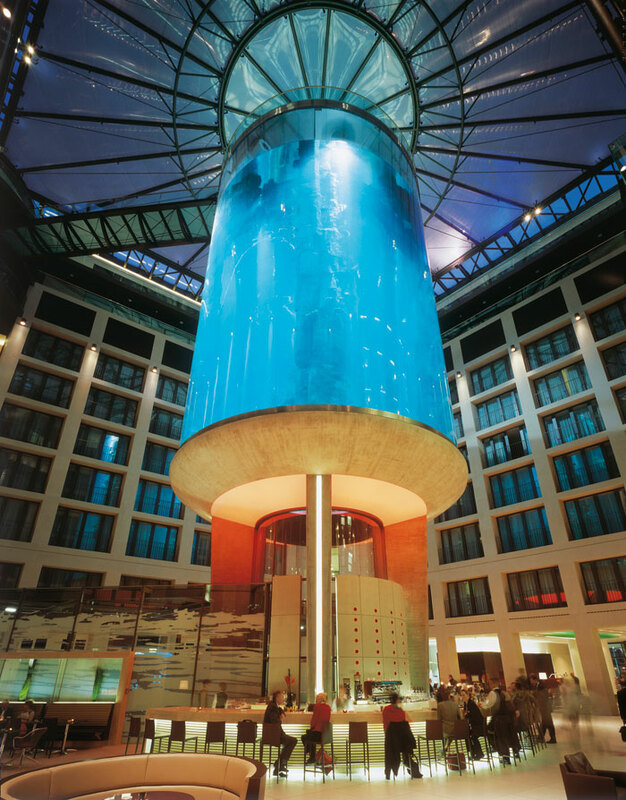 The AquaDom can be found at the Radisson Blu Hotel in Berlin, Germany. Furthermore, the hotel contains offices, a restaurant and the aquarium Sea Life Center. If you’re interested, you can sleep with the fish for 180 Euro per night. The hotel has 427 suites with fantastic sights of the tropical underwater world. Of course, if you feel a little sea sick, there are also rooms looking out to the city of Berlin. At first sight, the Radisson Blu Hotel in Berlin may look like just another luxury hotel, but appearances are deceptive. 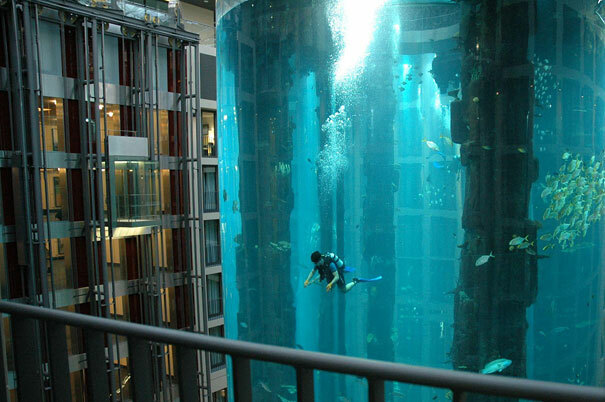 Once you enter the heart of the hotel, you will be blown away by the gigantic AquaDom. 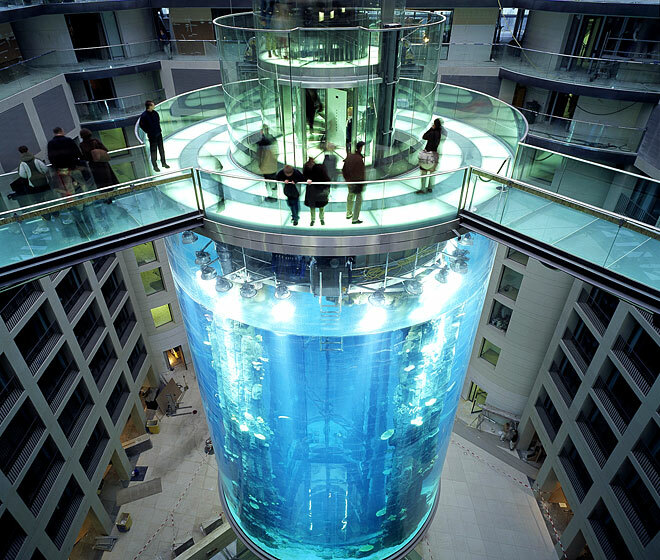 People will not expect an enormous aquarium like this when entering a hotel. I think this this is what makes this signal so extraordinary and attractive. Myself, I have never heard of the Aquadom before and it seems already impressive to me. Besides, I think it is attractive for guests to experience the tropical underwater world by taking the transparent elevator. It makes a city more livable, because you can escape the crowd and will enjoy the feeling like you are just somewhere else. But why is this a good signal? Individualization and digitalization have had a tremendous impact on our society. With the rush of today and the ever-competitive world, where we are constantly connected to the internet and getting a lot of information to us per day, signals like the Aquadom may fill up the emptiness and give us a little peace. Also globalization has had an impact on the signals that can be found today that will determine our future. As said in the beginning, we do not have to travel far to experience something spectacular or something we can find in another country. The society is trying to make it possible for us to bring things closer to home. Unfortunately, the guests can’t go for a dive in the Aquadom. Wouldn’t it be great if you can dive in an enormous aquarium like the AquaDom in the future? With signals like this, a city surely offers enough to citizens and gets more identity. People don’t have to look far for their activities in the future. New places will emerge where you can find unique things. Companies and organizations will do everything to offer citizens enough and make a city more livable, sustainable and peaceful.